Gaussia princeps is shown to be a diurnal vertical migrator which spends its days below 400 m in the oxygen minimum layer and migrates to shallower depths (200 to 300 m) at night. This species consumption was measured at 3.5°, 7° and 10°C and 1, 14, 28, 61, 121 and 181 atm of hydrostatic pressure (1 atm corresponds to approximately 10 m of depth). The Q10 of the oxygen consumption is shown to be higher at lower temperatures and higher pressures. Hydrostatic pressure is shown to have significant effects on the oxygen-consumption rate at pressures as low as 28 atm. 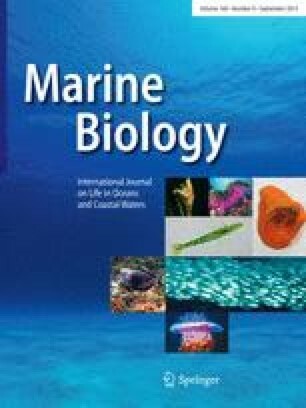 At all temperature and pressure combinations, G. princeps displays a very low metabolic rate compared to shallow-living copepods. The critical oxygen partial pressure for this species is shown to be about 10 to 13 mm Hg O2 at 10°, 7° and 5.5°C. Based on these data, a predicted relation between depth and oxygen consumption by this species off California, USA, is presented. This shows a higher oxygen-consumption rate at the nighttime depths and a much lower, partially anaerobic metabolism at the daytime depths.